It is always interesting and humbling to make a realization about one’s self. My most recent one is my ability to resist anything and everything. Though a kindly acupuncturist had said to me at one point, stop resisting your life, it wasn’t until I read an article recently that I had this epiphany over my resistance and just how deep it can go. I know I’m not alone in this, we all resist and more often than not, we resist things that actually make us feel good emotionally, physically and spiritually. These are the things that help us actualize our life’s purpose and elevate our being. Eat better….exercise…practice yoga….practice your craft…go after what you really want…accept what you need to do on a daily basis to make your life work. Do you come up with reasons not to do these things or resent having to do them sometimes (ALL THE TIME?)? As I sat with the article I realized my resistance is like a wall of giant boulders, stacked as high as the Hoover Dam. Each boulder is some other element of life that I can choose to resist. The upshot is I spend an excessive amount of time suffering because I’m so busy keeping these boulders stacked up, thinking life should be some other way or trying to avoid the things that would help me. On the far side of the boulders is my actual life, a giant pool of water that so desperately wants to move and flow. Our bodies and minds find ways to notify us of our resistance. Mine recently came up with a low back that went kablooey (is that a word? Whatever, it is now.) the week after Christmas. All fall I’d been holding the boulders up against a busy work schedule, children’s illnesses and injuries, familial demands, holiday prep and a household that feels like it is a war-zone of toys and clutter. My self care practices of yoga, exercise and singing weren’t happening because I was so busy wanting my life to be different and holding my boulders. A trip to the chiropractor and a few x-rays later I discovered that the neck injury I knew I’d had for years and once upon a time had managed well through yoga has lead to decreased disc space and no natural curve in my neck. In addition my 5th lumbar is compressed, sacrum rotated forward, right hip raised, left hip lowered and the muscles in that area all in spasm. In the words of the chiropractor, you have a lot going on. That is true on so many levels. Once I got over being freaked out and angry and, well, resistant to my current state, I remembered the words my husband once said to me (see, I’m surrounded by these sage people once I actually pay attention): Don’t get mad, get curious. His context for saying it was to get me to try and respond differently to my then 2 year old daughter who had me at the end of my rope, but I still think about that phrase (especially when dealing with my children, but other times too). When I decided to stop suffering about it, I was able to see that I possess the tools to take a look at my back and in conjunction with the work I’m doing with the chiropractor, make it better. Out came my book of yoga therapy (thank you Doug Keller for the work you do) and I delved in. Not surprisingly, my psoas muscle is a key player in the ills of my back. Though I am quite familiar with this muscle, I saw things in a new way as I researched it in terms of my own body. The muscle shares connective tissue with the diaphragm and is connected therefore, to our breath and fear. DING, DING, DING, we have a winner. I have no doubt that over the years, my resistance (fear) over accepting the things I must do and not doing the things I should do to help me be my best self, finally caught up with me. So, here’s my commitment to myself. I shall do the psoas lengthening, hip releasing exercises that take me to point of being nearly pain free immediately, every day even though I know they call up emotional stuff that I will work to just observe and not indulge in. And, I shall begin to pull the boulders down from my wall, lessen my resistance to what is and commit to things that help me self actualize. The boulders won’t go away, but I can learn to observe them, acknowledge their existence and then let the river of my life flow around them, making different choices and accepting what is. Now, if you don’t mind, I’m going to go spend a little time warming my voice up and not resisting the fourth snow day in a week that I’m having with my kids. 1. Take your shoes off. Seriously, it is that simple. No matter how low the heel, shoes will throw your alignment off. Heeled shoes pitch you forward and make your body contort itself to try and stay as a vertical column and it gets worse the higher the heel. So, whether you are wearing cushy, comfy running shoes or 3 inch heels your body is creating patterns that will hinder your joints and muscles which, in turn, alters your breathing which, in turn, alters your voice. If you’re really serious about it you can switch to wearing ‘barefoot’ shoes, but the transition time into those should be long to allow your body to accommodate them. And, I admit the barefoot shoes aren’t exactly cute. I’m still working on getting over that part. 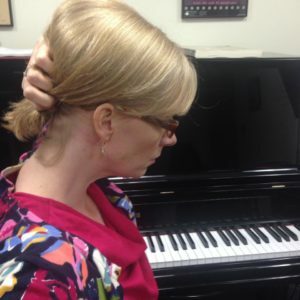 If you are sitting at rehearsal or sitting at a piano or sitting to watch TV, you need to be mindful. For the vast majority of us we tend to roll back and sit on the tailbone/sacral area. This puts your pelvis into a tucked position. Couple that with the shortening of the hamstrings that happens from lots of sitting and you have a recipe for alignment disaster! To sit properly in a chair, sit far forward so you can feel the Sitz Bones (the bottom of your pelvis on either side). You can drop one knee to help make your pelvis move towards neutral. Think about this the next time you are in a rehearsal and sitting for 2 hours straight! When you stand today, look down at your feet. Have them pointing straight forward – often we stand with our toes turned out, a la a ballet dancer (fewer folks stand with their toes turned it, but those need to be straightened too). Have your weight more in your heels than your toes. 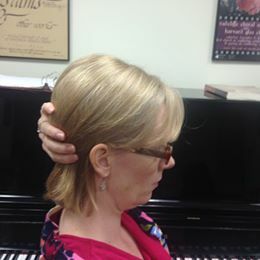 Un-tuck your pelvis, keep your ribs over your pelvis (often they are thrust forward) and reach the crown of the head up which drops your chin slightly. Don’t spend your entire day sitting. Take frequent breaks to walk around. Just going to the gym at the end of the day is not enough to undo the act of sitting for 8 hours. Try to get up every hour and walk for 5 minutes. Walk mindfully by standing well and carrying that into your walking. Aim for 10,000 steps a day. Today’s scintillating topic is the back of your thighs and what they do to your pelvis. Those three muscles, collectively called your hamstrings, are what we spend a lot of time sitting on. Very often when we exercise we shorten them as well. When they get shorter they pull on your pelvis, and in consort with some other muscles and ANY SHOE WITH ANY KIND OF HEEL, move your pelvis into a ‘tuck’ position. As you can see with my exaggerated tuck position, my upper spine also rounds. For many people a tucked pelvis also comes with a forward thrusting lower ribcage (sorry I wasn’t able to contort myself into that position). 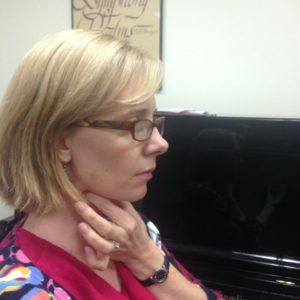 If you have a tucked pelvis, a thrust forward ribcage and then a rounded upper spine, is there any chance your larynx is going to be optimally aligned in your throat? Nope, nope and nope. While the feet are the foundation in many ways, what is happening in the pelvis when it is viewed as a foundation, is equally important. So, start by taking your shoes off when you sing, are in your house and any other time that you can! 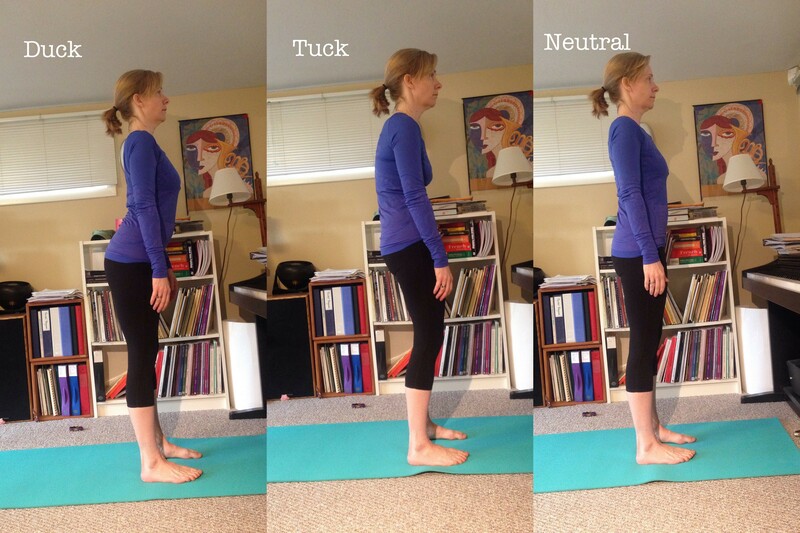 Now, Rome wasn’t built in a day and it will take time for you to even begin to assess whether you have a tucked pelvis that needs addressing and then you’ll need to spend time adjusting your alignment to find the mobility to un-tuck it. This is where yoga can help. For many people with tight hamstrings and a tucked pelvis an aching low back is also often in play. So, we need a pose everyone can do, but especially those with achy backs. Reclining Big Toe Pose is the answer! Really, yoga is always the answer, right? This pose is in my top 10 of favorite yoga poses. In this version look at the leg that is on the floor. There is no space between the hamstring and the mat; the back of my leg is touching the floor. Begin lying on your back, knees bent, feet flat on the floor. Hug your knees into your chest and wrap a strap around the balls of the toes of one leg. Extend the opposite leg out on the floor. Be sure the pelvis is untucked. 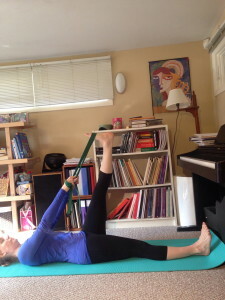 As you extend the strapped leg into the air pay attention to the small of your back. Is it flat to the floor (meaning your pelvis is tucked) or is there a little space behind it (meaning your pelvis is untucked). Move the leg in the air to where it is straight AND you have the pelvis untucked. It may be that the back of your other leg is touching the floor – but if you have super skinny legs it might not. Walk your arms up the strap until they are straight. Don’t yank on the strap, just let the action of the arms falling back into the shoulder be what gives you the stretch. My leg is wayyyy closer to my nose, but my pelvis is totally tucked and my leg on the ground popped up. So much so that I drove a little lego car underneath it to show you the space. (What you can’t see is the pile of legos and matchbox cars and allll the other toys just behind my head because I shoved them all out of the way to be able to take these pictures). 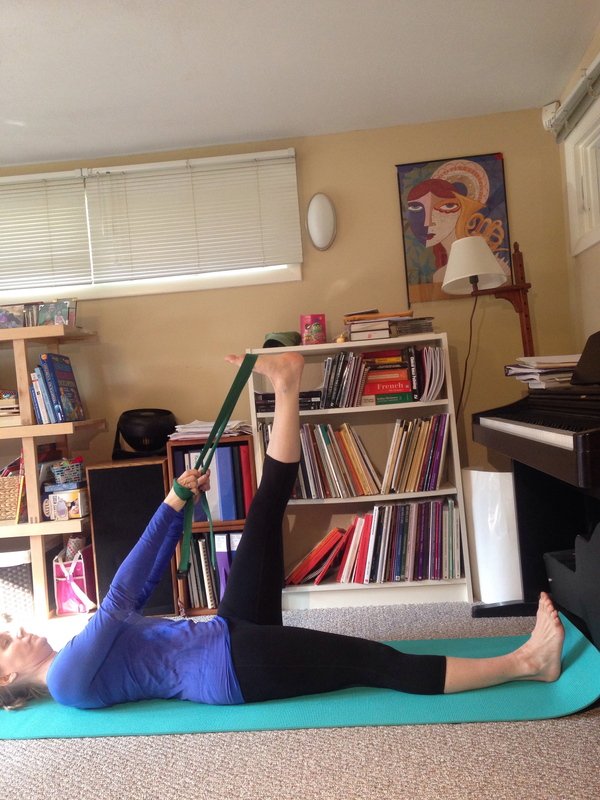 This pose is a great place to start to begin to find some release and relief for your legs and pelvis. Try to hold the pose for 3-5 cycles of slow inhales and exhales. Then get up and walk around and notice how you feel!